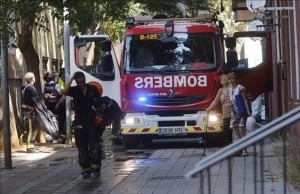 An apartment fire in Barcelona left the young siblings dead on Monday morning as emergency services are still investigating the cause of the blaze, local newspaper La Vanguardia reported. Their two-year-old brother was fighting for his life after being pulled from the flames at the apartment block in the Sant Martí district of the Catalan capital. The fire began at about 9am within a ground floor flat where the three children lived with their mother. The youngest sibling and mother were both badly burned and around 11 other people also suffered injuries due to the fire. Some residents of the building were injured when they attempted to escape the flames, including some Chinese tourists who had jumped from a balcony to get away. The cause of the fire remains unknow but it might started because a short-circuit produced in one of the electrical appliances. Moreover, the family were connected to the power illegally. Lack of fire protection in such buildings leave every year many dead people in cities arround the world. Unfortunately, this is not the first nor the last fire. A smoke detector and a fire alarm could have alerted the authorities before and they would have enough time to rescue those children alive.